What constitutes Netflix'ing? Anything more than 2 episodes? What if they're only 22 minute programs versus 42 minute ones? Anyways, I don't tend to binge watch much (there was that week with Arrow) but I do steadily chip away at certain shows like Knight Rider, The Rockford Files, assorted anime and in surprising depth, Wings! I had no idea I was into season 5 of the former NBC mainstay but hey, I've had Netflix for a couple years now and tend to turn the show on for background noise every now and again. The story of Joe and Brian Hackett, bros who grew up in Nantucket, had a crazy dad, an absent mom and then ended up running a charter airline in a tiny New England island airport. 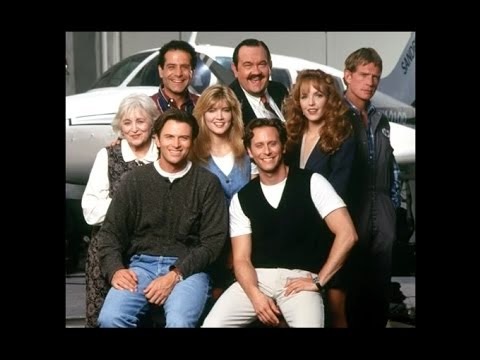 Their day to day struggles running the airline, competing with neighbor Aeromass and dealing with kooky friends and passengers gave life to 8 hilarious seasons of sitcom goodness. From the guys that brought you Cheers and later Frasier, David Lee and Peter Casey's situational show was a regular fixture in my after school on USA Network watching in the 90's and it still makes me laugh today. You had Joe (Tim Daly) the responsible bro and his crazy and womanizing brother Brian (Steven Weber) always screwing things up along with their multiple time widowed ticket taker Fay (Rebecca Schull), sleazebag yet successful rival Roy Biggins (David Schramm), lunch counter owner and would be love interest Helen Chapel (Crystal Bernard), dumb yet brilliant mechanic Lowell Mather (Thomas Haden Church) and cab driver from Italy Antonio Scarpacci (Tony Shalhoub). It wasn't about irony or mugging to the camera and saying "really? ", it was just the sitcom crazy lives of these offbeat characters. Sometimes things got a little dramatic (house they grew up in getting demolished, plane crashes and strands them at sea, Joe has a meltdown) but for the most part the not too offensive humor derived from the everyday goings on of dealing with family and friends, running a business and the pratfalls of broken dreams (Joe wanted to fly jets, Helen is a trained orchestra cellist, etc). It's always fun to watch old shows and see if you spot anybody who went on to something more substantial. Off the top of my head I recall Matthew Fox playing a high school baseball prodigy, the kid from Entourage, E aka Kevin Connolly as a high school reporter, John Hawkes from Deadwood as a waiter and of course a few familiar faces from Cheers like Kelsey Grammer's Fraiser along with George Wendt, John Ratzenberger and Kirstie Alley. 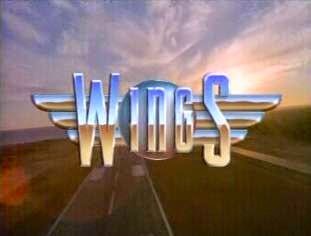 Airing Thursdays in 1990 on NBC, Wings would be shuffled around the prime time schedule multiple times over it's 8 year run, moving to Fridays, Thursdays again, Tuesdays and finally Wednesdays for the last seasons. At it's peak, the show was a top 30 staple for 4 seasons, tying with powerhouses like Fox's The Simpsons and ABC's NYPD Blue. A handful of Emmy Nominations followed though none for the main cast or the show itself. After the last season aired in 1997, star Tim Daly would remain a familiar face on shows like The Sopranos, a new take on The Fugitive and a near 100 episode run on Private Practice while providing the voice for Superman in several series and animated films. Television brother Steven Weber popped up in lots of indie flicks, including Leaving Las Vegas and has guest starred on at least a dozen shows you've watched before like The Simpsons, Tales From the Crypt, Law & Order and Without a Trace. Crystal Bernard has released a couple of albums and written for Paula Abdul and Lisa Stansfield. David Schramm more or less got out of the Film & TV business but continues to act on stage and Broadway. Rebecca Schull is currently appearing on ABC Family's Chasing Life while Thomas Haden Church left Wings to appear on a Fox's Ned & Stacey and has kept up a surprisingly solid output in TV and Film with Tombstone, Sideways, Spider-Man 3 and Broken Trail to his credit. Tony Shalhoub starred on the long running Monk and appears in 2013's greatest film, Pain & Gain!